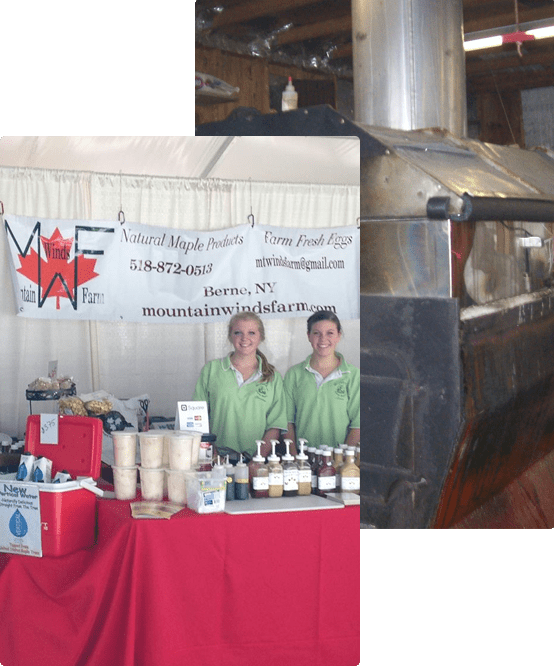 ​Mountain Winds Farm’s primary product is maple syrup. Randy, a Master Forest Owner trained at Cornell University, started his maple syrup operation in 2005 with 50 pails, and has been growing the operation slowly and sustainably ever since. Today, the farm boasts 50,000 feet of pipeline and 1,300 taps with the capacity to produce 500 gallons of syrup each Spring. Despite this significant growth, Randy prides himself for maintaining his independence as a small, family-owned maple farm. Randy works closely with his children to show them the ropes of making premium maple syrup, so they can one day continue the family tradition and business with their children. Together with his family, Randy makes each batch of maple syrup with his wood-fired evaporator by hand. The wood-fired evaporator gives the final product a very mildly smokey, and extremely delicious flavor. In addition to maple syrup, Randy also produces value-added products like hard and soft maple candy, and maple cream. You can find these products available for sale in our ONLINE STORE. Mountain Winds Farm also raises laying hens for eggs, meat chickens, and a seasonal crop of vegetables. The farm is 100% hormone-, antibiotic-, pesticide-, and GMO-free! "Your hard maple candies are the best. Your powder Maple Sugar is great for making Pig Candy (candied bacon) in a smoker. Copyright 2019 Mountain Winds Farm. Website by Delco Creative.